I am a Liverpool Football Club fan. I am a fan of Jurgen Klopp. I know a decent amount about football – I have been watching it since I was five and talking about it, debating it. reading about it, listening to smart people talk about it for all those years. This afternoon, I watched Everton embarrass themselves and the great history of their great club by the manner in which they approached a game as if they were a non-league team looking for a FA Cup giant-killing. But I want to write about some other folk embarrassing themselves and their great club this afternoon. I want to talk about the aforementioned Jurgen Klopp. Let’s get it straight. Everton were rightly awarded a penalty. It was a foul. It was a moment of stupidity from Dejan Lovren – imagine my surprise – as he pushed a player who was going away from goal and offering no threat. It was a gift to Everton who deserved nothing from the game and should have left with nothing. Sadly, the stupidity didn’t end there. Lovren complained about the decision at full time to the referee in conduct that in other sports would guarantee him a lengthy ban. 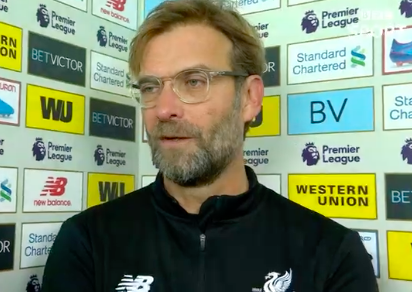 This was confounded by his manager’s reaction, which was not only ill-judged – he claimed that anyone who thought it was a penalty didn’t understand football – but was childish, insulting and frankly risible. Managers in the Premier League are under enormous pressure – like many other people in many walks of life, who don’t receive the sort of financial and other rewards that go with these football jobs – and in the heat of the moment they are entitled to get things wrong – they are only human. But to continue to defend the indefensible, long after the red mist should have cleared, is shocking. What is worse is that Mr Klopp is my club’s most visible ambassador and today with his petulant, mocking behaviour, he has let it down. I and my fellow Liverpool fans will be here long after Mr Klopp and his successor and his successor have gone on to pastures new; the least he can do is to be a custodian of not just its results but its values in the meantime. At Liverpool we pride ourselves on knowing our football and telling it straight – we clap other teams off who beat us fair and square – we don’t try and pull the wool over our fans’ eyes. We leave that sort of nonsense to others who lack our class.